Remember Matt? A little snow in Portland and he's gone fully metrognome. Ha! He waits all year to wear that hat and then goes "I've had this hat since college. I bought it for $19.99 at WalMart." EVERY TIME. ah, but today was sooo lovely and warm! xmas in NYC is magical... how could any decent person not fall in love? just get him a good hat/gloves/scarf set and hit the streets... you'll be golden. I feel bad. Nick wanted to wear his Fargo ear-flap hat out in the snow today but I scowled and claimed to see something living in the fake fur. Us Portlanders just don't know how to handle snow. At least some of us. I prefer to grab some tea and watch safely from my apartment window as douchebags in snowsuits slip and bust their asses on the sidewalk. Who wears a snowsuit in the city? I've been madly trying to find a hat for H-town with the $7 I have left in my budget. His current winter headgear is this manky red and white knit thing that makes him look like Hippie Santa. I have survived my first Chicago winter, I'm now working on the second. If it doesn't kill you it makes you stronger...right? haha awesome. 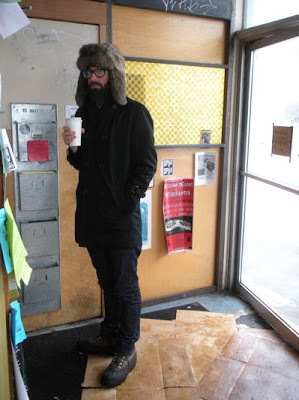 Is he standing in the foyer of Stumptown?